Single sheet restaurant pads are suitable for use within restaurant or take-away establishments where only one copy is required. A waiter’s pad cover keeps restaurant order pads neat and tidy and professional looking. 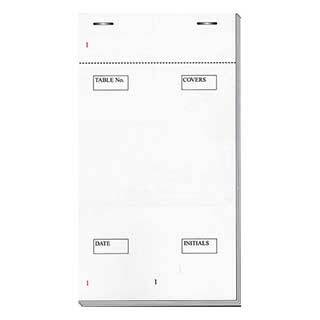 Carbonless restaurant order pads are suitable for use within restaurant or take-away establishments where duplicate copies are required. 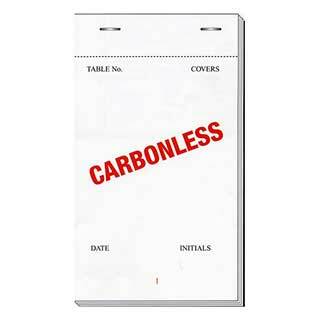 Restaurant order pads with carbon are suitable for use within restaurant or take-away establishments where duplicate copies are required. 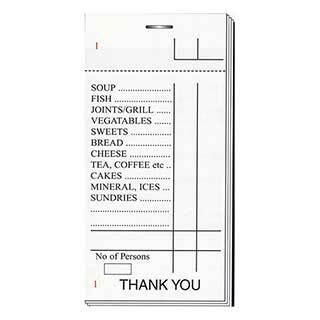 In our wide range of high quality restaurant order pads we have pads which are suitable for any size of business or establishment. All our pads are manufactured from the best quality paper to British standards. Our range includes single copy, duplicate copy with carbon, NCR (carbonless) duplicate copy, NCR (carbonless) triplicate copy and NCR (carbonless) quadruplicate copy. Single copy restaurant pads are for general use in a restaurant or take-away. Duplicate pads with carbon paper fitted are suitable for use within a restaurant. Our NCR (carbonless) range in duplicate, triplicate or quadruplicate copies are used in restaurants.